How do you turn a poetry collection into a stage show? If you’re Claire Trévien, it seems, with incredible poise and power. 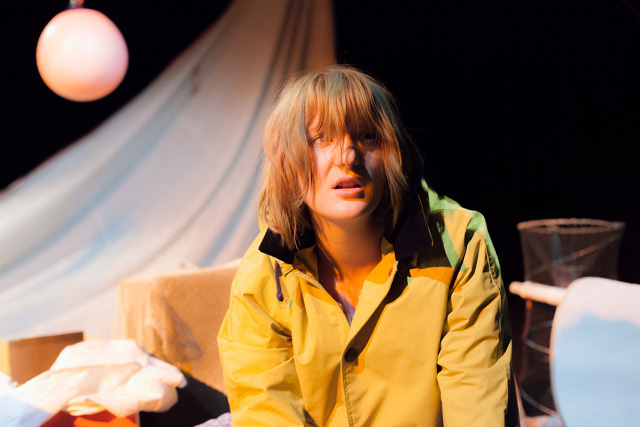 The collection behind Claire’s touring show is The Shipwrecked house (read my review of that here). When I learnt that Claire was taking the poems on the road in dramatic form, I was agog to find out how she would transform it for the stage. And I was far from disappointed with the results. The Cube is definitely one of Bristol’s quirkier venues. Entirely volunteer run, it has, in the most charming way, a curious sense of being a bit of flotsam washed up by storms itself. As we entered the building and waited to enter the theatre space, we heard piped recordings of seabirds lilting overhead. An atmospheric start! 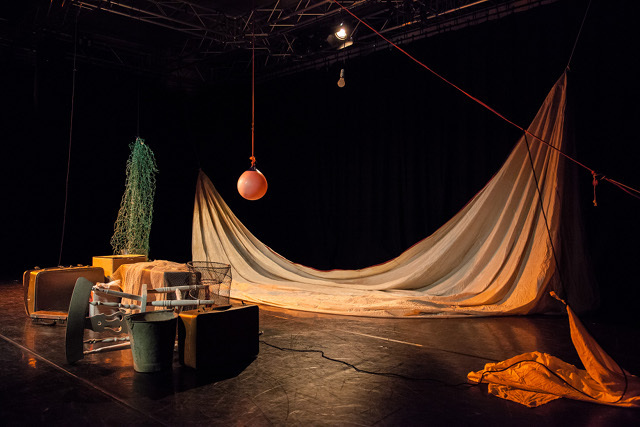 Laid out with a set comprising ropes, nets, buckets and buoys, the play opens as Claire stumbles through an old familiar home by torchlight, where memories sit shrouded by tarpaulins and old suitcases contain unexpected treasures (some of which may make you jump). Water drips resonantly, and Claire exhales the words of her poems supplemented by sparing quantities of recordings in English and French, plus the sounds of the elements, as a storm closes in. Visually, this is a stunning, atmospheric creation conjuring up hints and imaginings where a suitcase can reveal hoarded shells, or tiny coloured bulbs ablaze. Trévien steps nimbly through it all, spilling into grief, nostalgia, humour and charm with apparent ease. 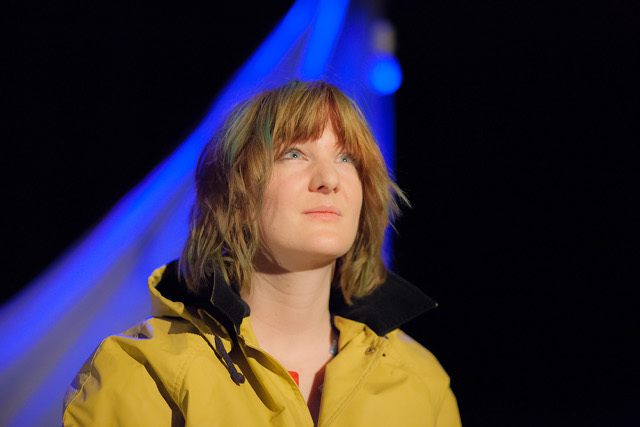 Both poet and performer, she uses every inch of stage and prop with an explorer’s hunger, rediscovering her own stories so we can share in them with her. 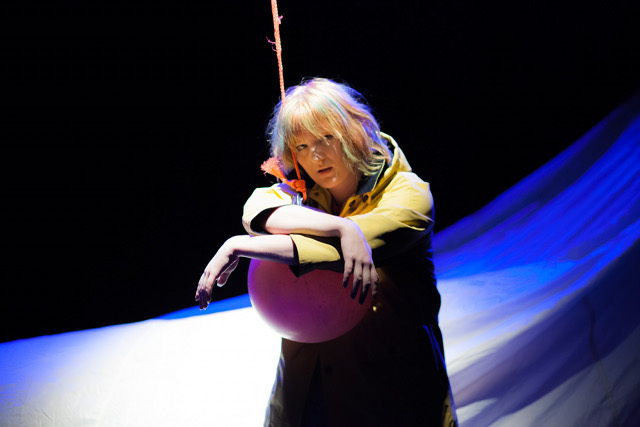 Both sound and light are orchestrated by Penned in the Margins publisher and director Tom Chivers, presenting an ocean of a play, with tides and waves, moments of stillness, and beauty by the bucket-load. And yes, there are whales, “making the hinges rock,/ splitting cups and cheeks./ Stray socks melted in their comb-mouths”, reminding us of the strength of things unseen but suspected. Find tour details for The Shipwrecked House here. All images in this post are by photographer Josh Redman. To submit or suggest a review, please send an email to Judy(at)socketcreative.com.